What is that saying? If you love something set it free. If it comes back, it's yours...if it doesn't, it never was. Whilst I have complete confidence that my little chef brother Nick will come back to me in good time, it was still really hard to let him go. Ok, so technically he is not little (he is 6 foot something) but he is still one of my four younger brothers who I love like crazy and don't want to let go. 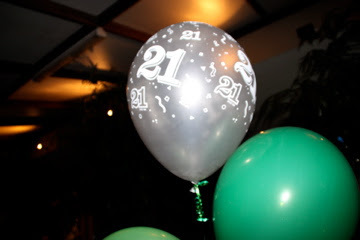 Nick turned 21 last month (my baby is all grown up! 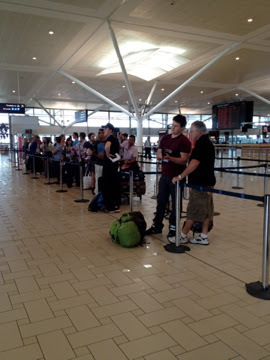 ), and left for a two year working holiday in Europe this week. 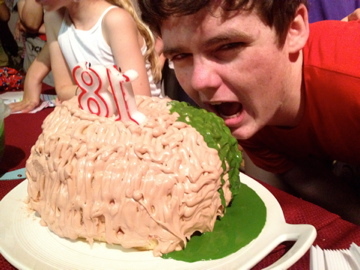 Nick is an avid lover of all things zombie, he even made a green slime and brain birthday cake last year for baker brother Dom's 18th birthday. Some of the left-over green goo was fed to the chickens that week. It turns out food dye makes Dr Seuss stories come to life. Do you like green eggs and ham? So with this love of zombies in mind, when Mum and I were brainstorming idea's for a Nicholas worthy cake, I remembered yet another awesome gift given to me by Chloe. 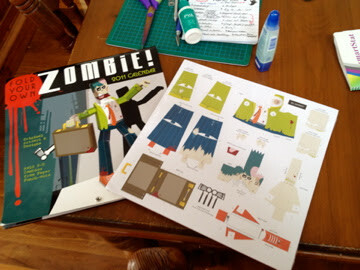 A fold-your-own zombie calendar! 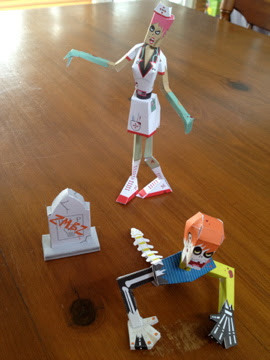 One zombie for every month of the year. So we bought an awesome, mountainous looking chocolate mud and profiterole cake and got to folding some zombies that could try to navigate its terrain in search of brains. Pretty cool huh? 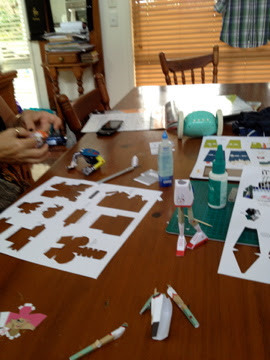 I love me some papercraft, and I appreciate a good zombie every now and then, so when they came out on the cake, I was pretty bloody satisfied with how super they looked. 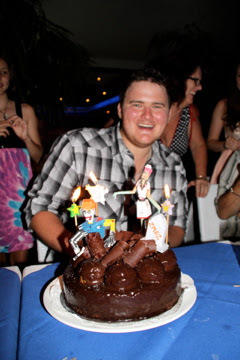 Unfortunately, being that I don't know how to use my DSLR (really must tend to that New Years Resolution), the picture really doesn't do the cake justice, but the joy in Nick's face is genuine. And once again, just like the Nyan Cat Cake, the kitchen staff at the restaurant got a little excited and joined in the fun, drizzling some raspberry coulis all over the cake to look like blood. 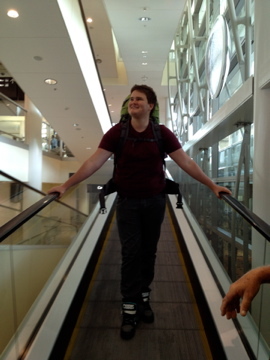 So with a green backpack and a kindle full of zombie novels, Nick headed off to London-town. 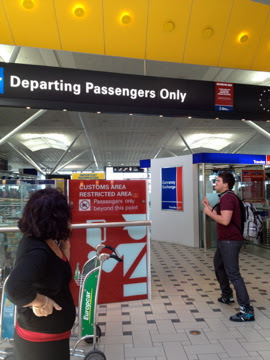 Dad, Mum and myself travelled up to Brisbane to send him off on his big adventure. 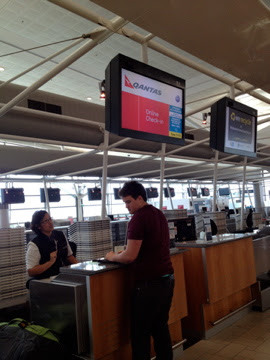 Of course, the exact time he walked up to check-in his luggage was 11:11. I couldn't help but take photo's of every step. 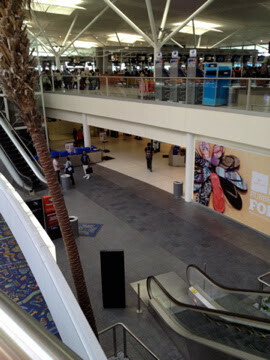 This is where we had to have our last hugs as the sign says "Departing Passengers Only" and unfortunately, there was only one of us who was departing. 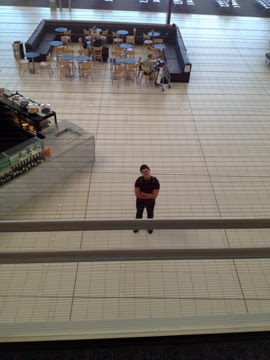 Here he is looking up at his mother with love right before he heads through duty free and off to his departure gate. 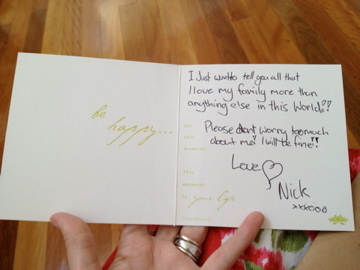 When we got home we found a beautiful little card left by Nick, reminding us to be happy. "I just want to tell you all that I love my family more than anything else in this world!! Please don't worry too much about me! I will be fine!! 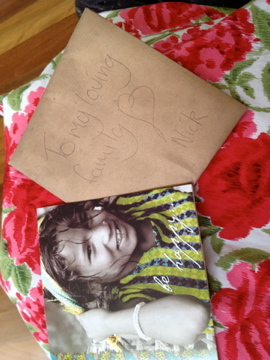 Love Nick xxxooo". If I can make my children half as beautiful and loving as my mother has made hers, then I will have done an amazing job. He has since arrived safely and is right this moment, exploring London with Tim, our 25 year old Flash Programmer brother who has been living in London since May 2010. He is going to have such an amazing time. Adam and I wish we could go visit them both, but we are very busy trying to make babies. And as if I don't put enough pressure on myself to get pregnant (it's all I have ever wanted, and no...I can't 'just forget about it'), Nicholas gave me a voucher for Christmas which promises me Nicholas's temporary return to Oz for when I finally do have a baby. If only I could get pregnant, then I could have a baby of my own (and stop contemplating stealing someone else's) and my boys would come home to me. Selfish I know but that would be all my dreams come true!